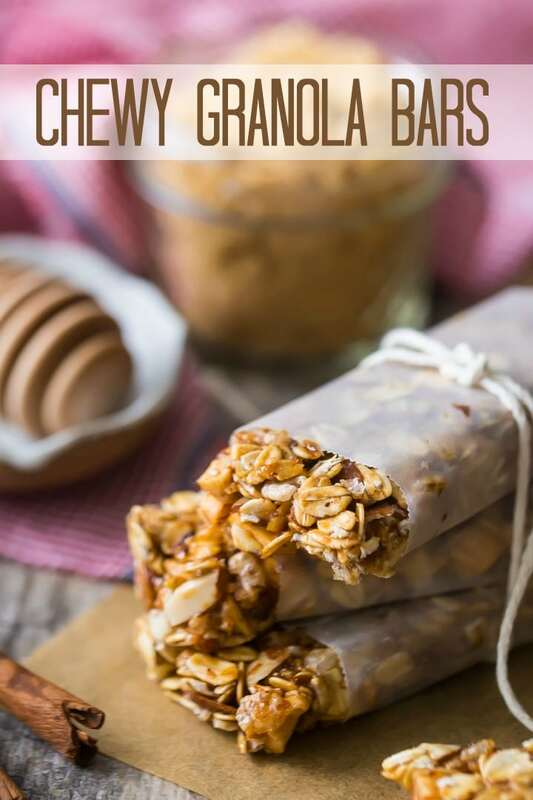 These chewy granola bars make such a great breakfast or snack! An easy as can be, no-bake recipe that you can totally customize to your own taste. School starts for us in just a few days, and at this time of year, I start to think a lot about easy, on-the-go breakfasts for my kids. There’s never enough time in the morning, but I really want them to start their day with bellies full of something wholesome. I have a lot of great recipes on this site that they really love. I try to keep a big batch of homemade waffles in our freezer at all times, and my little guy loves these chocolate chip mini-muffins. Homemade granola is another big favorite, not just for my kids but for my husband and I as well. 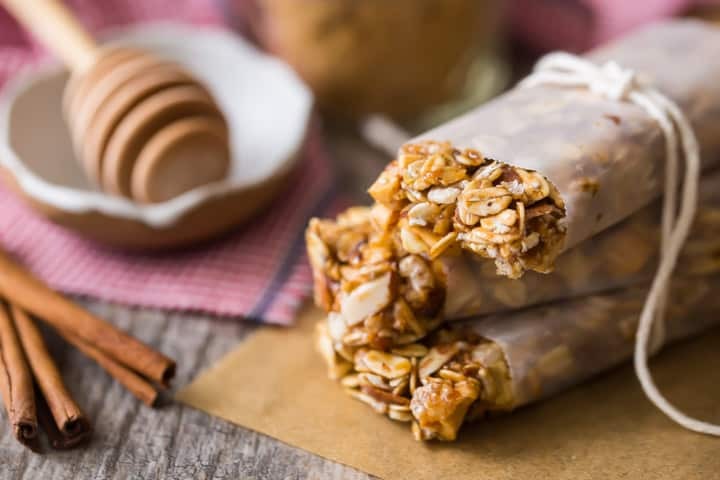 So I thought it would be nice to add these chewy granola bars to the roster! 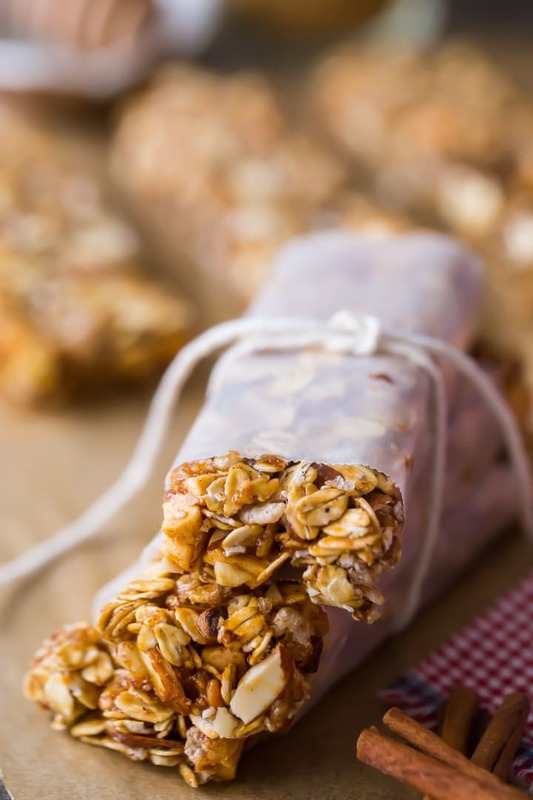 This is a classic homemade granola bar recipe. It’s got oats, puffed rice, nuts, and dried fruit, all held together with honey, brown sugar, and nut butter. I used old fashioned oats, but quick oats would work well too. And I’m partial to almonds and dried apples, but you can totally mix it up and use whatever add-ins you like! This recipe is super-versatile, so feel free to make it your own. This recipe has honey in it, so no. But if you want a vegan version you can just substitute the honey for maple syrup, coconut nectar, or whatever liquid sweetener you prefer. ARE THESE GRANOLA BARS NUT-FREE? I put sliced almonds in mine, but they are totally optional. You can replace them with any kind of nut: walnuts, pecans, pistachios, you name it! Or, if you need a nut-free option, try sunflower seed kernels. And you can sub the nut butter for sunflower seed butter. If you’ve never had it, you’ve gotta try! It tastes almost identical to peanut butter- YUM! ARE THESE CHEWY GRANOLA BARS GLUTEN-FREE? If you use gluten-free oats and gluten-free puffed rice, then guess what? You’ve got an awesome gluten-free breakfast or snack on your hands! 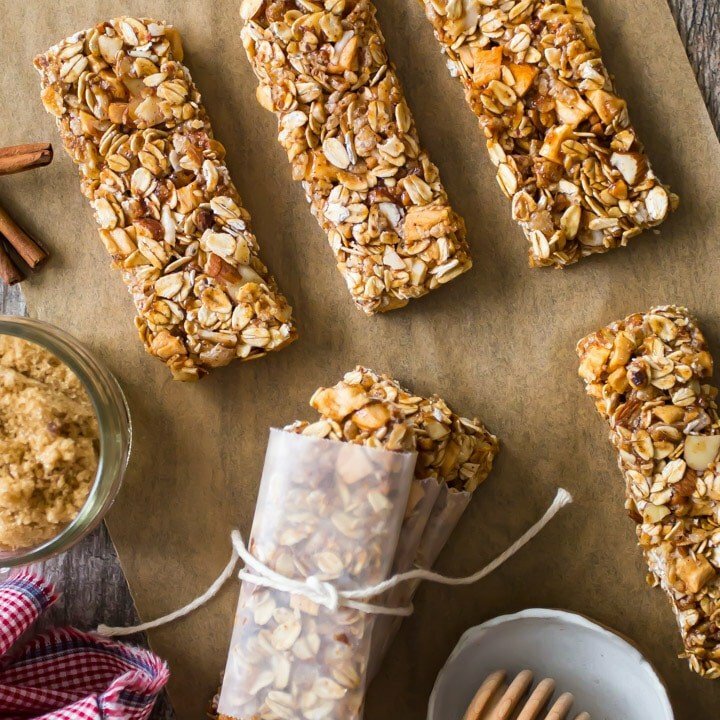 These homemade granola bars are super-simple to make. If you invest about 20 minutes making this recipe, you’ll have 12 bars to enjoy. Start by combining the oats, puffed rice, nuts, and dried fruit. I forgot to show it on the video below, but I also added a touch of cinnamon. I think it makes these bars extra delicious! Stir together, and then get your honey, brown sugar, nut butter, and salt into a small pot. Heat it gently, allowing it to simmer for a minute or so and get thick. Turn off the heat when you add the vanilla- those flavor compounds are very volatile and you don’t want to burn them right off! Give it all a stir, then pour it over your oat mixture and toss to combine. Press the granola firmly into a 9 by 9-inch square pan. It’s a good idea to give your pan a little mist of non-stick spray, and I like to line it with parchment as well. It makes it really easy to lift the granola out of the pan when it’s ready to cut into bars. Once the granola has cooled you can cut it into bars! I am partial to my pastry scraper for cutting bars, but any sharp knife will do! I hope you’ll give these chewy granola bars a try! They’re so hearty and wholesome; a great way to start their day. Especially on those busy weekday mornings! Lightly mist a 9 by 9-inch square pan* with non-stick spray, and line it with parchment. Place the oats, puffed rice, nuts, dried fruit, and cinnamon in a large bowl, and stir to combine. Place the honey, brown sugar, nut butter, and salt in a small pot and cook over medium-low heat (stirring) until simmering. Allow the mixture to boil for about a minute, until thickened. Pour the hot liquid into the oat mixture, and stir to combine. Press the mixture into the prepared pan, and allow it to cool for about 1 hour. *An 8 by 8-inch pan can also be used; your bars will just come out a little thicker. Click here for the non-bar version of this recipe: Basic Granola Recipe. Allie, these bars look delicious! I have all the ingredients on hand so will definitely be trying them! I love homemade granola bars! These look so delicious and so easy to make! 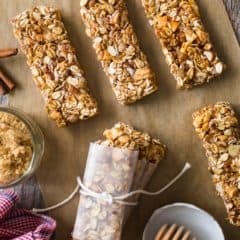 I love homemade granola bars- so easy to flavor any way you want! Perhaps my almond nut butter didn’t have the oil vontent yours did but my liquid ingredients never, even after adding some coconut oil, got ro the liquid boiling consistency yours did. Tastes yummy but a mess to mix.